"The road has been a long one and filled with many stops and starts. I would say never be afraid of having to do things over and over again because failure is not weakness or "bad". It's a way to know how to move forward." My professor explained, learn the things you don't know, don't waste your time learning what you already know and don't waste time reinventing the wheel. Theresa did her co-op as a residence worker. She shares about her learning experiences and her future goals. "I hope to be someone that other Indigenous youth can look up to, and a person that others can count on in my everyday life. And hopefully I can get into Law school so I can help Indigenous peoples fight for their rights." "Just do it! If you get invested in your education you want to continue, and the rewards are extraordinary! Even when it is hard, you continue to do it. I’ve learned so much since starting, it’s phenomenal." "I will continue to encourage students out there to dream and that its okay to be scared but don’t’ let that fear hold you back." "In all of my years, I worked to be well known, respected and network with many people. Those networks proved to be worth-while as I worked my way up the ladder. It pays to make good connections that has strategically helped me out when I needed them." My proudest moment was being the first of a class of 12 from NEC to graduate at SFU. There are so many obstacles one must crawl over to get a degree especially being an older student. "My big picture goal is to work in policy to strengthen the health and well being of Aboriginal Peoples by working to combine Aboriginal children, families, communities and health into a single concept that is so interconnected that they can not be teased apart to be treated as independent entities." Work hard nothing in life is easy, be honest to yourself and others and maintain your principles and values. I believe my desire to help bring understanding between First Nations people and the rest of the world is what drives both my educational and work career; it keeps pushing me to learn and try new things, and onto all kinds of different windy roads. Theresa Contois is a Coast Salish business owner. She took possession of Marmalady catering company November 1st and is in the process opening a café in January. Here is an interview touching on various aspects of her business experience. I have discovered that learning from others, is the greatest way to avoid making mistakes; and listening to others with the intention to truly understand, is the greatest way to gain a real education; after all… “An education is what remains after one has forgotten everything he/she learned in school” (Albert Einstein). Randy Jack is from the Cheslatta Carrier Nation. He is now an outreach worker with the Vancouver Recovery Club.Here is a series of question and answers to learn more about his education and career experiences. Angela writes about coming to SFU, the Indigenous connections she found, and how her job search found her back in the New Student Enrollment and Transition department. Audrey Tooshkenig reflects on her experience at the 2012 Indigenous People's Career Stories event, and how she managed to overcome a brief dip in her self-confidence to present to a room full of earnest listeners. Crystal Morris shares her education and career journey, which has included a wide variety of roles in government, and the private sector, and how they brought her to where she is today. On February 21st, the Indigenous People’s Career Stories event took place at the Diamond Alumni Centre. This was my first year attending the event and I was pleasantly surprised. I learned that the brilliant thing about college is everyone is at different levels. After I completed my diploma I went on to get my bachelors at Royal Roads University and graduated with a Bachelor of Commerce in Entrepreneurial Management. I am currently taking a Masters Degree in Health Science at the School of Population and Public Health at UBC. I have gained a tremendous amount of knowledge on evidence based medicine, medical biostatistics, clinical epidemiology and public health. Learn about some of the employers and Indigenous student recruiters you can network with at the Indigenous Peoples Career Stores event. Gerald was born in Lytton, BC. He is a Status Aboriginal man and is a member of the Lytton First Nation. He shares the career journey that led him to becoming an Aboriginal Correctional Program Officer, making a difference in the lives of Aboriginal youth. Career Services is hosting its annual Indigenous Peoples Career Stories event on February 21st, 2013 which brings opportunites and experiences directly to SFU's Indigneous students. Everyone wanted to know what others were planning to do with their education. I remember one classmate’s mother asking me: “what sort of job are you going pursue with a degree in Political Science?" Every Liberal Arts student has confronted this question, and most – if anything like myself – have struggled to answer it. Never give up. No matter what anyone says? As I say to my kids: “Stand tall, shoulders back and walk proud. You have to beleive in yourself, because you can do it!" Professor Hunter, my family (Uncle Kelly, Mom and Grandparents) have and have always had great confidence in me. This is where my strength comes from. Like most youth/students, there is a mixture of confusion, fear and excitement about what to do next. working to keep the family fed. My mother tanned hides, did beautiful beadwork and made clothing and bedding. We danced to the fiddle and sang." "I grew up in Squamish BC, learning from elders and knowledgeable community members about Squamish Nation culture. Many of my fondest memories are walking to downtown with my grandpa, sitting at my grand uncles kitchen table and going up the river to fish. During these formative years I was always careful to listen to what they had to say." "My father was Cree and French and my mother Cree and Scot with both parents fluent in the Cree language. I come from a family of ten. We lived in poverty as Road Allowance Metis around Sundre, Alberta, after my parents left the Metis Settlement of Kikino, Alberta in 1943 with 4 children in tow. " "With the uncertainty and changes in healthcare systems for our people and a separate health authority plan that will marginalize our people, I decided to be where my skills and services will be most beneficial." How a girl from Wetsuweten Nation became a leader in the Nursing field. "Having not graduated from high school, I feared academic inadequacies and had a lot of self doubt about attending post secondary. Fortunately, a dear friend basically took me to an Academic Adivisor to discuss my prospective plans. By the time I left that appointment I knew that I was on my way to my next phase." teasing, wild speculation, humour and tears. “Nothing in the world can take the place of Persistence”. Through my life’s experience I can certainly attest to the truthfulness of these words.I hope lessons for others can be found in them. Hence, “Press On” friends and make your own dreams a reality! Brandon is a professional Contemporary Visual Artist based in Langley. He grew up in the Kwantlen Reserve and went on to study at Kwantlen University and attained his BFA from the Emily Carr University of Art and Design in 2006. My name is Mike & I'm originally from Little Black Bear’s Band in the Treaty #4 area. I am in my final year of a First Nations Studies degree. 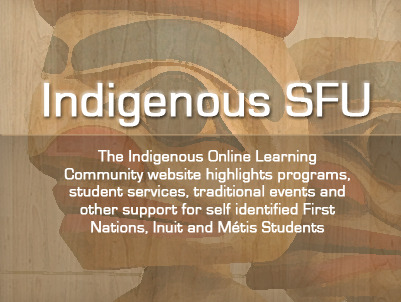 Our goal is to determine ways in which the Career Services team can better serve the indigenous student population. Listen to our Panel from various walks of life introduce themselves and discuss their backgrounds, their education, the obstacles they have overcome. These Aboriginal representatives are here to answer tell their story and answer your questions. If there’s someone who knows about the terrifying journey that is the work search, it is Marissa Nahanee. She was a panellist at the Indigenous Peoples Career Stories event on March 3, 2011. Marissa has worked on many world class events, including the 2010 Vancouver Olympic Torch relay and visits by Princes Charles and Edward. But Marissa’s job did not just happen to her – she had to work for it.